You might think that iron condor spread is a strange name for an option trading strategy - and indeed it is. But in a way, the image it presents is well suited to the setup. The condor was a large prehistoric bird. Like any bird, it had a body and wings. The Iron Condor is no different. It is a combination of concurrent bought and written (sold) option positions which effectively has a body - the sold positions - and two wings, being the bought positions. The 4 positions work together to form a formidable vehicle for taking prey, or profit. What is An Iron Condor Spread? The Iron Condor Spread is really just two credit spreads combined, but facing opposite directions. You take out a 'bear call spread' (sell call options closer to the money and buy them further out, in the expectation that future price is bearish) and a 'bull put spread' (sell put options close to the money and buy them further out). The end result is a credit to your account from both sides of the trade - and the fact that you receive double the premium helps to minimise the overall risk. Theoretically, you are relying on the market price of the underlying stock to remain within an anticipated range for this strategy to be profitable. But as we shall see later, one of the beautiful things about option credit spreads is that they can be adjusted, which means that ultimately, you have an excellent chance of making a profit whatever happens. Because you have established a trade facing both ways, it means that by the expiration date only one side of the trade can possibly lose. This would only occur if the price of the underlying asset moved strongly and broke through the outer bought position's strike price on either side. But the double credit premium works in your favour in this regard. Not only that, but because only one side can lose, any good options broker will only require collateral in your account to cover the maximum risk from one side of the trade. This gives you a much better return on risk than a lone credit spread. So what if the worst occurs and the share price does move outside one of the outer boundaries (wings) of your Iron Condor setup? The maximum loss at option expiration date is the difference between the strike prices of the sold and bought options on any one side, multiplied by the number of shares your option contracts cover. Notice we have said "at expiration date". There is no requirement to hold the position until it expires, but since any credit spread and therefore especially an iron condor, takes advantage of option time decay, you would take this into consideration when deciding whether to take profit or let it run further. You would normally set up one of these option strategies with a short term to expiration - say 3 to 6 weeks maximum. If the outer boundary has been breached, you can then assess the situation and adjust the position using one of the following alternatives. You close your original losing position and open a new one with the same strike prices, but with the next expiry date. Since both positions will be 'in the money' you will receive a premium larger than what you are losing on the closed trade. You close your losing position and open a new one further away from the original (expanding the wings) and with the next option expiry date. Your credit in this case will not be as large as in the first example, but you have now received three premiums from this strategy - and done so AFTER the strong move, so you should still make an overall profit. The other side (wing) of the iron condor spread which hasn't been breached will simply expire and you keep the premium. The best chart patterns are stocks that are basically moving in an identifiable 'channel' pattern. The channel could be sideways or trending, but you can draw a trend line over the tops of the peaks and under the troughs on the chart and see points of support and resistance. This gives you some idea of the potential range that the underlying is expected to remain within over the next 30-40 days. The chart pattern doesn't have to be a channel. It could be an expanding wedge pattern or a head and shoulder pattern forming at a long term resistance or support level. Chart patterns to avoid would be triangles or contracting wedges, because these can often precede strong moves and are therefore more suitable to straddle trades, not iron condors. When you set up your iron condor spread, the distance of the strike prices of each credit spread from the current market price of the share will determine the amount of credit you receive. Further away, there is less risk of the wings being breached but less profit as well. Make sure you only do this on a stock with lots of option liquidity. If one side goes deep-in-the-money you want to be able to easily adjust it without being at the mercy of market makers. Finally, use some good software to construct a dynamic risk graph so that you can visually see where your positions are in relation to impending expiration dates and current profitability levels. Sometimes and Iron Condor spread will need adjusting, should the price action of the underlying threaten its boundaries. To do this properly, it is important you understand how the option greeks work - and learn to use them to manage your positions "by the numbers" and adjust them accordingly so that you remain profitable. One trap that iron condor traders fall into, is that they wait until it's too close to expiration date before exiting the position. By this time, your ability to adjust the trade has been compromised. If iron condors interest you, read this article about the best time to exit them. 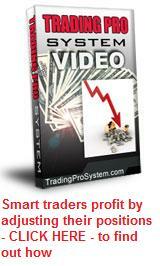 Watch a FREE video about Managing Trades by the Numbers.